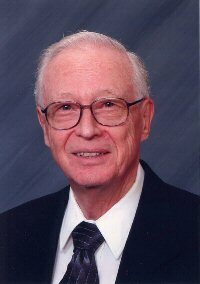 Sheldon E. Elliott was born July 9, 1925, in Asuncion, Paraguay, to Dr. Arthur E. and Ivy F. Elliott, who were serving as missionaries for the Christian Church (Disciples of Christ). After an early childhood in Paraguay, his family moved to Enid, Oklahoma, where he completed high school and one year at Phillips University before entering the Army Air Corps in June of 1943. Sheldon served as a navigator on Crew 51. He completed 30 combat missions, was promoted to First Lieutenant, and received the Air Medal with three Oak Leaf Clusters and a Distinguished Flying Cross. His final mission was flying over the battleship Missouri in Tokyo harbor at the signing of the peace treaty ending World War II. Our family has spent many hours listening to his accounts of the missions that this group accomplished. Sheldon also loved attending the B29 reunions that were held in previous years. After the war, Sheldon returned to Phillips University and graduated in 1948 with a Bachelor of Arts degree in Mathematics and Chemistry. He married his Phillips classmate, Dorothy Trueblood, on August 14, 1948 and continued his studies in graduate school at the University of Michigan. He completed a Master's degree in Mathematics in June 1949. He began his long career at Phillips Petroleum Company in 1951 in the Research and Development Department. Over his 34 years at Phillips, Sheldon served as Branch Manager of the Research Branch in Bartlesville, as Chief Geophysicist of Phillips' Europe-Africa subsidiary in London, and as Manager of Geophysics Worldwide in Bartlesville, until his retirement in 1985. Outside of work, Sheldon had a lifelong association with the Christian Church (Disciples of Christ) and the First Christian Church of Bartlesville. He was a church-school teacher and held offices of Administrative Board Chair and Chairman of the Board of Elders. He served in a variety of boards and committees at the Regional Church level and on the Board of the Council on Christian Unity of the Disciples of Christ. During his three years in London, he and Dorothy were members of the American Church in London, where he was Missions Chair and Vice President of the governing Council. After his retirement, Sheldon continued to serve the Church as an Elder, as a board member of the Christian Church Foundation, and on the General Board of the Christian Church (Disciples of Christ). In 1988, he joined the Board of Trustees of Phillips University, was elected Chairman of the Board of Phillips University in 1992, and was appointed Chancellor in 1994. For his services to Phillips University, he received a Distinguished Service Award, a Distinguished Alumnus Award, and the honorary Doctor of Humane Letters. He continued to serve on Board of Directors of the Phillips University Legacy Foundation. He was married to his wife, Dorothy of 60 years. They have three daughters Linda, Amy and Laura Ann, and three granddaughters. Sheldon Elliott took his final flight on Jan. 6, 2009.